Cappelletti are a type of stuffed fresh pasta originating from the northern Italian region of Emilia-Romagna, particularly around the towns of Modena and Bologna. They date back at least to the Middle Ages, when they were a luxury food for aristocrats' tables. 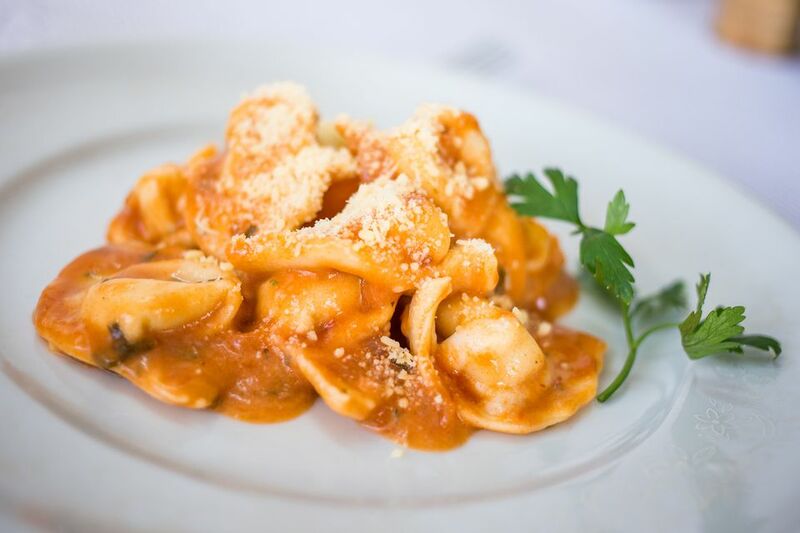 The name cappelletti means “little hats,” which is what their rounded shape resembles. Cappelletti can be made either out of circles or squares of dough, which changes their shape slightly, but the folding process is the same. They are most traditionally served in a meat broth, but can also be served in a meat sauce, in gently heated heavy cream, with a simple walnut sauce, or tossed in browned butter with fresh sage. Note: while there are multiple steps to this recipe, this Cappelletti dish is broken down into workable categories to help you better plan for preparation and cooking. In a small saucepan, melt the butter and sauté the chicken. Let cool and then cut into small chunks. Taste the mixture and adjust the seasoning, as necessary. Make a mound with the flour on your work surface and form a well in the middle. Crack the eggs into the center of the well, add the salt, and work the eggs and the flour together with your hands until you have a smooth dough, adding just a few drops of water, if necessary, and no more. Knead the dough for 10 to 15 minutes, until it is smooth, firm, and quite elastic. Don't skimp on the kneading or the dough will tear while you're rolling it out. Separate the dough into 2 pieces. Flour your work surface (marble countertops are ideal for this, though wood or Formica work as well) and start to roll out the dough, rolling out from the middle, flipping it over occasionally, and flouring it as necessary to keep it from sticking. Keep on flipping and rolling until you have a sheet that's almost transparent—as thin as a dime, or thinner if you can manage it, as the pasta will almost double in thickness while cooking. Once you've rolled out a thin sheet of pasta on a well-floured surface, use a round cookie cutter (you could also use a round or square raviolo stamp or a fluted-edge rolling pasta cutter) to cut out 2-inch-diameter circles of dough. Place 1 level teaspoon of stuffing in the middle of each circle. Using your fingertip or a pastry brush, moisten the edges of the circle with a little water so they will seal. Fold the circles in half over the filling to form half moons, pressing down with your fingers to seal the edge. Then pull the two corners towards each other, overlapping one over the other, and press down on the tips to help them adhere together. Gently boil the cappelletti in broth until they are done, 3 to 5 minutes (the pasta should be al dente). For each serving, place 10 to 15 cappelletti in a brimming bowl of broth. Gently boil the cappelletti in water 3 to 5 minutes, until pasta is al dente. Serve in a meat sauce or tossed with a bit of olive oil, salt, and pepper. Cappelleti are similar to, and often confused with, tortellini, another Northern Italian stuffed pasta. Both are generally made with a meat-and-cheese filling (though sometimes it's only cheese) and typically served in chicken broth, often on New Year's Day or as part of a grand Christmas feast or other special celebration. These days, they are a typical Christmas dish throughout Central Italy. The difference between the two pastas lie in the size (tortellini tend to be smaller, about marble-sized, while cappelletti are usually somewhat larger) and in the folding. A cappelletto resembles a stylish, peaked hat with a round, upturned (sometimes scalloped) brim, while the tortellino looks more like the commonly shaped "flower bud" Chinese wonton dumpling. Cappelletti are also quite similar in shape to the Russian dumplings called pelmeni, though those are larger and have different fillings.